Summary: Nick and her cousin Helena grew up in a world of sun bleached boat docks, tennis whites, and midnight gin parties at Tiger House, the family home on Martha's Vineyard. In the wake of the Second World War, the two women are on the cusp of starting their "real lives": Helena is off to Hollywood and a new marriage to the charismatic Avery Lewis, while Nick is heading for a reunion with her own husband, Hughes Derringer, about to return from the war. The world seems rife with possibility. The gilt soon begins to crack. Avery is not the man he seems to be, and Hughes has grown distant, his inner light curtained over. On the brink of the 1960s, Nick and Helena-with their children Daisy and Ed-try to recapture that earlier sense of possibility. But then Daisy and Ed discover something truly awful, and the dark thread of the family's history slowly starts to unravel. The secrets and lies that each member thought long buried begin to surface. When I saw that TIGERS IN RED WEATHER by Liza Klaussmann was recently released in paperback, I had to smile. I fondly remembered reading it last year while I was vacationing in the Outer Banks, and it was one of the best books I read during my rainy (yet book-filled) trip. It is a wonderfully written novel about a dysfunctional family and there was even a bit of a murder mystery thrown in -- or at least an event that set lots of things into motion! I loved how the author brought this time period to life, and it even reminded me a bit of THE GREAT GATSBY. If you are interested, you can read my more detailed review here. 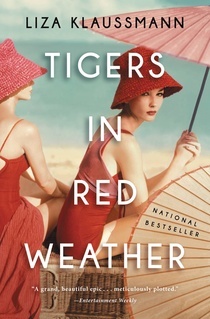 To celebrate the paperback release of TIGERS IN RED WEATHER, I have a copy (courtesy of the publisher) to share with one lucky reader. To enter, just fill out the form below before August 8th at 11:59 p.m. EST. I will randomly select and notify the winner the following day. This contest is open to those of you with U.S. addresses only. Good luck!